The CANIDAE® “All Life Stages” recipe is vet formulated for dogs of all ages, breeds, and sizes. That makes mealtimes for multiple dog households much simpler than dealing with multiple bags of different foods. Single dog households will also enjoy the beneﬁts of not having to guess or switch based on their dog’s age, breed, or size! Back in 2007 - well before we even considered running a website and magazine dedicated to dogs’ health and wellbeing - we came to the realisation that the nutritional profile of the food we were feeding our dog was dreadful. Despite being a young dog (12 months) Conner sadly started experiencing epileptic seizures within hours of eating – and though this does not prove causality, it was more than enough for us to stop buying a well-known dog food brand from supermarkets, because we might as well have fed him a takeaway from Macca's! After reading about the benefits of a ketogenic diet (high protein, high fat contents) we went on an extensive search for the right dog food that would prevent these occasional seizures and deliver quality nutrients and we aimed for a 32%-36% protein content. 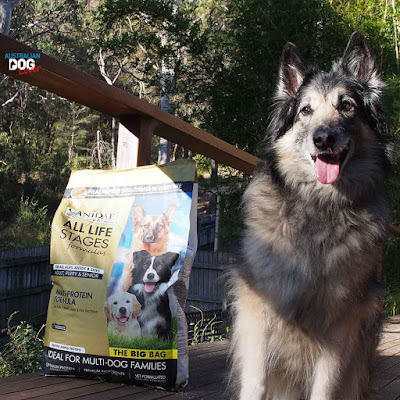 There were hardly any grain-free dog foods available in the Australian market so our choices were really limited to only two brands (both manufactured in the USA), which consistently received the highest ratings on well-established dog food review websites. Conner was underwhelmed by our first choice and sometimes did not want to finish his bowl - probably sugar cravings, because he cares nothing for nutritional charts! - so we gave up after one bag. 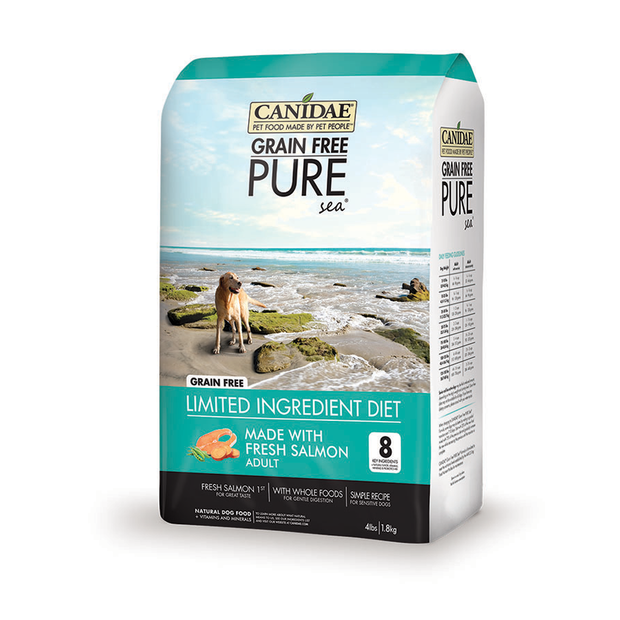 We decided to trial the CANIDAE® grain-free Pure Salmon next and looking back at Conner’s renewed zest for life (and the absence of seizures after meals), this was our best possible choice at the time and so it became our regular staple for a number of years. We remained loyal customers until their large bag size shrunk from 13.6kg to 10.88kg with not much change in the pricing - standard bag size in the US - but with our pack having expanded to 3 large dogs all with a solid appetite, this option became too expensive for us so we explored alternatives offering high protein contents. 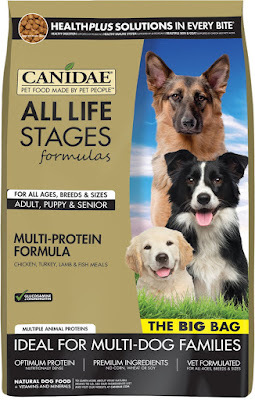 It's a shame we never realised until this year that CANIDAE® offered a number of “All Life Stages” formulas specifically targeted at multi-dog households (wait... that’s us!) available in a value 20kg bag! It was also great to learn that CANIDAE® are now also getting more involved in the growing of some of the ingredients used in their pet foods, e.g. peas, millet and milo, as well as a variety of vegetables and herb. 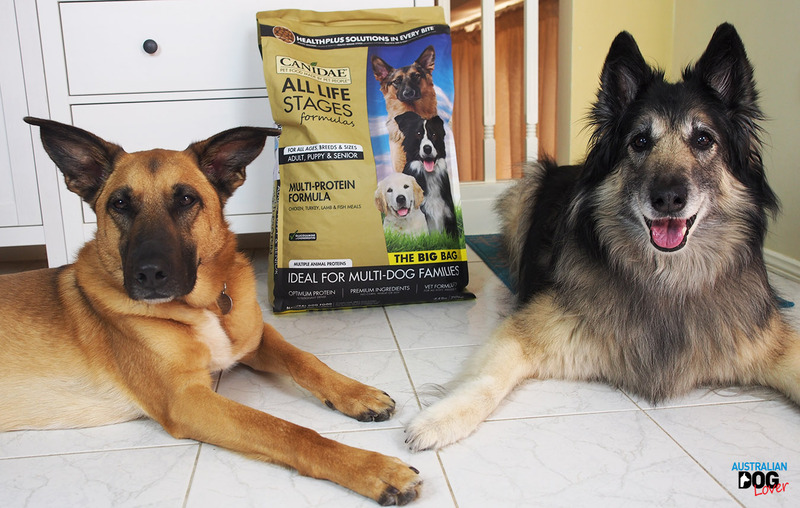 So when CANIDAE® contacted us a couple of months ago suggesting a free trial of their "All Life Stages - Multi-Protein" formula, our ears – just like our dogs’ – definitely pricked up and we were happy to give it a go with our 3 dogs, aged between 5 and 12 years, as they could now all be on the same diet. 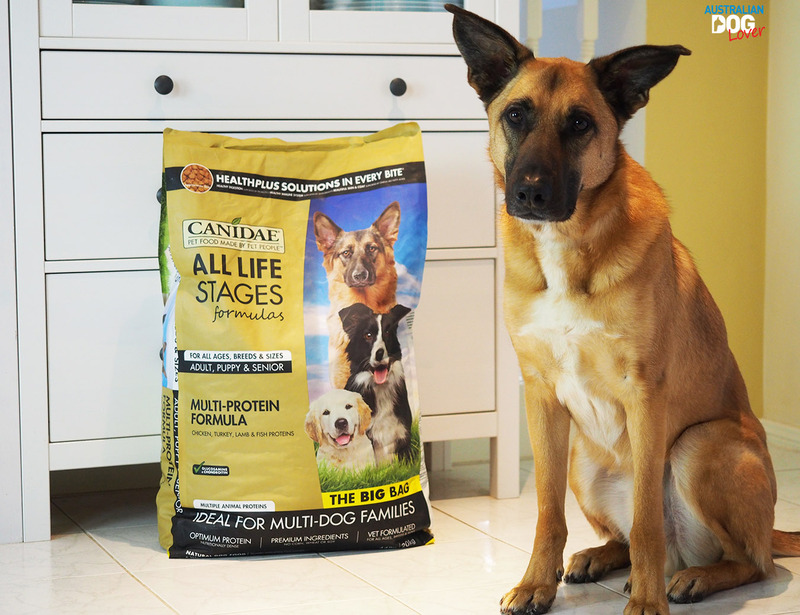 What’s in the CANIDAE® "All Life Stages Multi-Protein" formula? How many of us do take the time not just to glance at but thoroughly read the label of our dog's food ingredients? The first thing we noticed is that - unlike low quality dog food brands - this formula does not include any nasty fillers like corn, wheat, or soy! The top 3 ingredients are meat meals (chicken, turkey and lamb) - and because they’re weighed after being cooked - this means they’re more concentrated than just meats. Some people will object to rice as an ingredient but I don’t have any issues with feeding our dogs a small amount. Brown rice is a complex carbohydrate which (once cooked) can be fairly easy to digest, you'll even find it in some raw dog food options! However - aside from its natural energy content - rice is of only modest nutritional value to a dog. The sixth ingredient is rice bran, a healthy by-product of milling whole grain rice. The bran is fibre-rich outer layer of the grain containing starch, protein, fat as well as vitamins and minerals. The seventh ingredient is Peas, a quality source of carbohydrates and like all legumes, they’re rich in natural fibre. However, peas contain about 25% protein, a factor that must be considered when judging the real meat content of this dog food. The ninth ingredient is oatmeal, a whole-grain product made from coarsely ground oats. Oatmeal is naturally rich in B-vitamins and dietary fibre. The tenth ingredient is millet, a gluten-free grain harvested from certain seed grasses. Millet is hypoallergenic and naturally rich in B-vitamins and fibre as well as other essential minerals. 1. the inclusion of dried fermentation products in this recipe. Fermentation products are typically added to provide enzymes to assist with digestion. 2. flaxseed is one of the best plant sources of healthy omega-3 fatty acids. Here they’ve first been ground into a meal and flax seeds are also rich in soluble fibre. However, flaxseed contains about 19% protein, a factor that must be considered when judging the actual meat content of this dog food. And lastly, this food includes chelated minerals, minerals that have been chemically attached to protein. These are usually found in better quality dog foods as it makes proteins easier to absorb. As with every other formula in the CANIDAE range, the unique HealthPLUS Solutions® was added to the kibble after the cooking process. It includes probiotics to help support healthy digestion, antioxidants to help support a healthy immune system and Omega 6s and 3s to help support beautiful skin and coat. Chicken meal, turkey meal, lamb meal, brown rice, white rice, rice bran, peas, potatoes, oatmeal, cracked pearled barley, chicken fat (preserved with mixed tocopherols), millet, tomato pomace, natural flavour, flaxseed meal, ocean fish meal, choline chloride, sun-cured alfalfa meal, inulin (from chicory root), lecithin, sage extract, cranberries, beta-carotene, rosemary extract, sunflower oil, yucca schidigera extract, dried enterococcus faecium fermentation product, dried lactobacillus acidophilus fermentation product, dried lactobacillus casei fermentation product, dried lactobacillus plantarum fermentation product, dried trichoderma longibrachiatum fermentation extract, vitamin E supplement, iron proteinate, zinc proteinate, copper proteinate, ferrous sulfate, zinc sulfate, copper sulfate, potassium iodide, thiamine mononitrate, manganese proteinate, manganous oxide, ascorbic acid, vitamin A supplement, biotin, calcium pantothenate, manganese sulfate, sodium selenite, pyridoxine hydrochloride (vitamin B6), vitamin B12 supplement, riboflavin, vitamin D3 supplement, folic acid, cobalt proteinate, papaya, pineapple. This CANIDAE® All Life Stages super-sized bag certainly made mealtimes super easy however if you need to climb stairs, you'll get a workout carrying that 20kg bag around! This formula passed both the palatability test and the digestibility test with all 3 dogs even with super-sensitive Porthos - prone to reflux early in the mornings when we're asleep! This did not happen once during the 5 weeks of our initial trial but since we like to be thorough when we put a product to the test, we've reordered another bag 2 weeks ago. This nutritionally dense formula so far meets the needs of our three Belgian Shepherds despite the fact they're at very different stages in their lives. Many companies try to convince us that we should feed a specific “senior” diet to our 12-year old dog but in our opinion it’s more of a marketing angle - just like having breed-specific formulas. It may be a case of 'peer pressure' but our senior dog is still very keen to have his two square meals a day, - thank you very much! - even if he eats more slowly and may not require as much. If your dog food is of a high standard and completely balanced, then surely this diet would be suitable for any dog at any age, right - unless your vet advises you otherwise based on medical issues? We simply need to adjust the quantities based on our dogs' age and their activity levels. The Crude Protein content is only 24%, the Fat content is 14.5%, Fibre is 4% and Moisture is 10%. Also standing out is the 3.7% of Omega-6 fatty acids (no need for supplements!) and 0.5% of Vitamin E. Probably the biggest change in the last two years is realising that we no longer need to feed our dogs a diet with 32%-36% protein contents because they're not running a marathon every day! If you prefer not to feed grains because of your dog's allergies or sensitivities and are happy to pay a slightly higher price per kg, then we'd suggest taking a look at the CANIDAE® Pure Range with limited ingredients, with a great choice of proteins including Salmon, Lamb, Duck, Wild Boar, Bison and many more novel proteins. If you'd like to feed your cats a premium quality food, well CANIDAE® have a range for them too! As with any changes in your dog's diet, some dogs may do better by making a gradual transition over 7-10 days. It is advised to start with 25% of the new food mixed with 75% of the previous diet and gradually reverse these proportions until the transition is complete. The quantities fed daily will depend on whether you have a fast-growing puppy, an active working dog or more of a senior or 'lazy bones' at home! We ended up feeding each of our dogs 250g/day (125g twice a day), which is the recommended quantity for active dogs based on a weight of 30kg. Based on the RRP, you'd pay $6.99/kg so it could cost us $5.25/day to feed our 3 dogs. If you can grab a special, we've seen the cost down to $5.22/kg, which we felt was great value for this level of quality! RRP: $139.95 (20kg bag) from all good pet stores and online retailers but do keep an eye out for specials! Disclaimer: a 20kg bag of CANIDAE® "All Life Stages Multi-Protein" formula was offered to us in order to complete this review.